A quick stop in Sacramento during a road trip with my wife merited an 11th NBA arena visit to the Sleep Train Arena, better known as Arco Arena, home of the always-disappointing Sacramento Kings. The Kings took on the New Orleans Pelicans in a matchup that didn’t mean much this late in the season between two teams who won’t make the playoffs. This is more than likely my final arena visit for the 2015-2016 season. I’ve gotten to see two other arenas this season in Milwaukee and Washington DC. You can also check out the rest of my visits here. It was a late arriving crowd. Wednesday games are always hard for NBA teams to get good attendance for a game that didn’t mean much. The only exciting part in this one was getting to see Demarcus Cousins and Anthony Davis, the two centers who are better than Karl-Anthony Towns right now, go up against each other. Going into the game the Pelicans were 24-42 and the Kings 26-40. The game would end with the Pelicans killing the Kings 123-108. A few game observations. Anthony Davis is impressive, that is obvious. I never paid attention to James Anderson of the Kings but he had a nice stroke from three. Speaking of nice strokes from three, baby Dirk aka Ryan Anderson couldn’t be stopped. He was splashing from every corner of Sacramento. It was also interesting to see Seth Curry get meaningful minutes with RajOn Rondo hurt for the Kings. I was trying to imagine him as a consistent NBA player and I couldn’t. He just didn’t seem to add much, but I am sure he will find his way around the league. He had 11 points off the bench for the Kings. 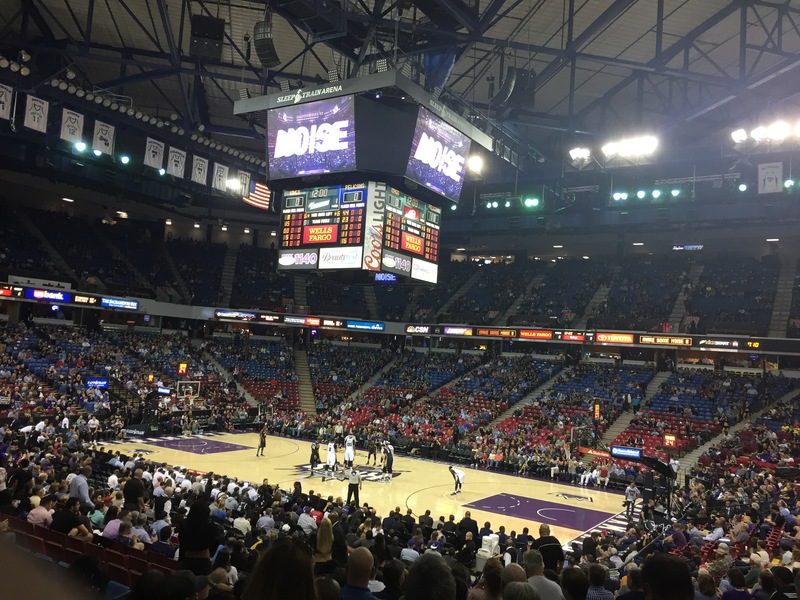 In terms of arena, Sleep Train Arena is in its final season of operation. The Kings are building a new stadium that prevented them from moving them to Seattle a few years back. The Kings have played 28 years here, a year longer than the Wolves have played in Target Center. There is a good amount of history between the Wolves and Kings in this building as they had epic playoff battles in the early 2000’s. One moment that sticks out is when Anthony Peeler elbowed KG in the face here. It was the definition of a traitor move. As I walked around the arena, there was still remnants of those early 2000 Kings teams. There were tons of Bibby, Jackson, Webber, and Divac Jerseys. The older players even made appearances via video in the stadium. The old Kings were fun to watch, but for whatever reason it seemed like Kings fans were holding onto that glory. I even saw a lot of Tyreke Evans jerseys. Remember, he won Rookie of the Year and looked like he would be a super star at one point. It was Latino Night at the stadium and it was done great, compared to what was displayed for Latino Night in Minnesota. The Kings displayed the diversity the Latino culture has and had lots of in game entertainment from a Salsa and Beso cam to mariachi bands. How the Timberwolves approached this night was laughable and likely would’ve been offensive had the Wolves had a larger Latino fandom. Outside of that, the arena looked old. It had wood flooring around the stadium. The chairs were worse than the seats at the Metrodome. But you can’t be mad because it was their final season there. The fans were incredibly passionate once they arrived to the game. Lots of boos once it was half time and the Pelicans scored 74 points. Many fans stuck out the entire game regardless as the casual fans exited the building with 7 minutes left. As I visit these, I think eventually I will start ranking my experiences. This will definitely be amongst the lowest. But I will develop a scoring system that will make it less subjective. P.S. I posted this before finishing since I am on the road still. But I hope you enjoy!